Surrey, British Columbia has recognized the importance of a number of trees associated with their history. There is, for example, the Avenue of Trees, a row of planted ceremonial trees, including 14 Douglas Firs and 3 Western Red Cedars. significant for its connection to the British monarchy. Planted in 1937, this tree celebrates the coronation of King George VI and Queen Elizabeth. It also helps to mark the historic centre of Surrey, and has ties to the royal forest at Windsor Great Park, England where the tree, as a sapling, originated. Surrey has other historic trees, some of which are quite unusual. One is the Rock Tree, a Western Red Cedar growing out of a split glacial boulder. The tree holds spiritual significance to the local First Nations community who has given it the name ‘Th’exsiyamia’ meaning ‘pushing forward great respected one’. Although not unheard of for trees like this to grow out of rocks in the mountains, it is uncommon to find a tree of this size growing from a boulder in the lower mainland. the trees that were cut down by early loggers in Surrey. It is now a reminder of the town’s early history and of the scale of pre-settlement forests in the area. Several areas have also been registered historic places specifically for their affiliation with trees significant to Canada’s cultural heritage. A trip to Vancouver’s Stanley Park National Historic Site of Canada, is not complete without visiting the giant hollow tree, the subject of attention by tourists and locals alike for over 100 years. 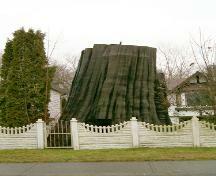 The massive dead tree stump of this long-standing attraction has been held up by a growing mass of metal braces and cables after it suffered serious damage from a powerful windstorm in December 2006. Although plans to remove the tree have been attempted, public outcry and funding through private donation have twice thwarted this endeavour. Calgary’s Wood’s Douglas Fir Tree Sanctuary, protects a collection of Blue Douglas Firs that have nearly been eliminated from the province by fires and lumbering. Significant to the local First Nations community, this area is known as ‘man-a-cha-pan’ which can be loosely translated to “the place where they go for bows,” providing the neighbouring Bow River with its name. Prince Edward Island’s Royalty Oaks Natural Area consists of what is perhaps the largest concentrated area of the province’s official tree, the Red Oak. Once utilized for fox farming and gathering lumber for the wooden shipbuilding boom, this almost untouched area, now a public site, is home to trees most of which are over a century old! If you find yourself in Ontario’s Niagara region be sure to visit the Copper Beech Tree located in the Battle of Lundy’s Lane National Historic Site of Canada at Drummond Hill Cemetery in Niagara Falls. The site of the battle itself, Lundy’s Lane, was a major encounter during the latter stages of the War of 1812 involving American troops clashing with the British and their Canadian and First Nations Allies. The lengthy battle is known as one of the bloodiest confrontations during the war and signaled the termination of American offensive operations in Upper Ontario (Ontario). The Copper Beech tree itself was planted on January 1, 1914 to commemorate the 100th anniversary of the Battle of Lundy’s Lane. Nearly a century old, this commemorative tree stands sentential over the nearby graveyard where the soldiers of the war lie buried, an enduring testament to the sacrifice they made. From coast to coast, trees form a significant part of our culture and identity. In fact, the Canadian Forest Service estimates that trees occupy almost half of this country’s terrain. Historically, trees have been vital to the development of Canada and our forest industry continues to play a significant economic role. For their spiritual, cultural and natural advantages, the Canadian Register is proud to recognize and celebrate trees as living monuments to our history. Discover your roots!